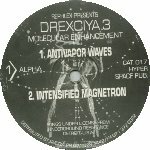 Drexciya 3 'Molecular Enhancement' came out first in 1994 on Rephlex and reappeared again a year later on Submerge with 2 additional tracks(possibly after Drexciya 4). The latter release is the definitive version but respect is certainly due to UK label Rephlex for being the first European label to licence Drexciya music and introduce them to what would become their major market. Considering they had at this stage only put out two EP’s which were themselves only available outside the US as imports it’s even more impressive that the label best known for it’s connections to Aphex Twin should be so on the case. There is something quite prophetic about this transatlantic liaison so close to the beginning of their career as they would gradually, by their 1999 hook up with Tresor, deal exclusively with European labels. Not to mention the fact that Rephlex themselves would put out a Transllusion LP and 12” almost ten years later. The reason for the 2 additional tracks on the Submerge edition may be due to fears of the label that no one who bought the Rephlex version would want to buy it again without the lure of something extra. Certainly some time elapsed between the two releases, it would not surprise me if a band as prolific as Drexciya had by then come up with some more tracks that they felt complimented the original EP. On the Rephlex label it reads that the tracks are licensed from UR, but it would be Submerge which would finally put it out. Of course I have already explained how both labels go hand in hand so while there may have been some delay in the US release I don’t think it was due to UR postponing it or something like that. As far as the release dates go I’m only going by the information I can gleam from their Discogs entries as I wasn’t even aware of Drexciya at this time and maybe someone else who was will let me know if this information is wrong. Musically this is a meaty 6 tracker which as you can imagine further expands the Drexciya musical palette. I suppose it is so far the most bold release to date, still ‘techno from the deep’ only getting deeper and weirder. The track and sub-titles etc share the same theme/abstraction which seems to be about adapting to this aquatic environment. This follows on quite naturally from the initial location/hint of ‘Deep Sea Dweller’ to the journey to Drexciya of ‘Bubble Metropolis’. Now that we have arrived we need to adapt. On a basic level they seem to be implying here that biological science will be our means to this change. This change might not be as extreme as we think because this is simply a case of ‘molecular enhancement’, developing what we already have and using technology such as an ‘Intensified Magnetron’ and ‘Hydro Cubes‘, whatever they are, to bring us the rest of the way. The biological part might be the use of ‘Antivapor Waves’ to alter our biological structure along with somehow introducing ‘Aquatic Bata Particles’ to our body, perhaps produced by ‘Bata Pumps’. The sides of both editions of the vinyl continue the science theme and are named Alpha and Beta. But it’s the images used on the Rephlex edition that are the most revealing(the Submerge artwork being only text with some molecular drawings). They look like a human figure under going a 2 stage transformation. It’s not exactly in the same league as the famous Leonardo Da Vinci depiction of Man but it would pass for the same thing. This all reminds me of the evolution part of the Strom series, but this is purely a physical change that is going on here. Evolution was certainly a constant theme with Drexciya, it was perhaps inevitable that they would go beyond the physical to examine the mental. The remainder of the label text on both editions reads ‘Special thanks to God and Mad Mike of UR. All songs were particle accelerated by Drexciya in Drexciya, ion filtered at Black Planet Studio in Detroit.’ This tells us a few things, I guess they were feeling grateful at their third release and were obviously still working closely with Mad Mike Banks. The tracks were certainly done at their own studio but some additional engineering must have occurred at UR’s Black Planet Studio, perhaps for edits or simply mastering as ion filtering would not be a common studio practice! This EP is well represented on The Quest, with only the 2 additional Submerge edition tracks omitted. As these two tracks are relatively short maybe that was the reason, although the opener ‘Anti-Beats’ is the longer and neither are inconsequential. ‘Antivapor Waves’ has a nice bass line and scuttles along with some sharp edged sounds. ‘Intensified Magnetron’ is harder and more insistent but maybe it doesn’t really go anywhere. ‘Hydro Cubes’ is the classic track on here for me with at least two Drexciya signatures on display and a nice breakdown. The surprise on this one comes with the voices at the end asking, “Does God really exist? God is virtual reality.” This is a really weird touch, maybe the oddest Drexciya moment to this point. Another strong track for the closer ‘Aquatic Particles’ which has a nice groove which would go down a carefree storm on the more open-minded dance floors. This EP was included in UR’s 2003 reissue campaign and now appears on coloured vinyl. As a side point I’ve found it quite difficult to find Drexciya stuff on the web. For research I went to the Clone shop and found most if not all of the Drexciya listings unavailable and even at Submerge itself I couldn’t locate very much. If anyone knows a good online site with a fairly complete and in stock Drexciya section it would be worth sending it to me so that I can post it here. Now that we are fully adapted to our new environment we can more fully explore Drexciya 4 - ‘The Unknown Aquazone’, which is next. Why did you decide to name your new project Der Zyklus? This concept has been present for some time now it is not a recent invention. This is the latest theme within this conceptual template. The first vinyls of Der Zyklus released by Gigolo in the late 90's was electro beats-oriented. Why did you change a musical direction on "Biometry"? The Biometric theme required a different technical perspective and the science of biometry stimulated the musical electronics. The music reflects concept of biometry. How did look your work on music for "Biometry": were it a rapid eruptions of inspiration or a slow experiments with sounds? There is no single method for music development everything is considered. Whatever instigates the musical idea will be considered its stimulant. There is no formula or rectrictions on methodology. Musical creation should always be free of contraints. Are there any elements of laboratories researches in your work in studio? How long lasts work on music for "Biometric"? There was no time frame in which work had to be completed,when the concept is comprehensive then it is considered complete. Time tables are not a part of our working ethos. Why did you concentrate on "Biometric" on experiments with rhythm structures? There are rhythms throughout this work,everyone has a different perspective of what rhythm is. Percussion is not the only source of rhythm,waveforms are also rhythms. Patterns that repeat themselves is rhythm. No certain sound or percussive element is exclusively a rhythm, every element produces its own rhythm. 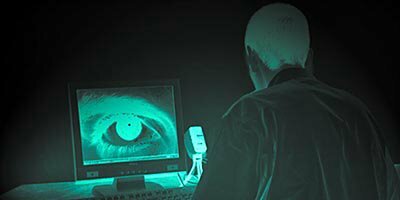 Some parts of "Biometric" sounds like avant-garde classic modern music. Did you find any inspiration in this style during your work? Actually the enviornment is the fundemental inspiration for a musical work and this embraces everything, sound, science, social structure etcetera. Inspiration has no boundries. What is so fascinating for you in science? Well science is a body of knowledge that mankind has accumulated over the ages about the natural world,the greater universe. We use this knowledge to gain command over nature for the progress and benefit of the human race. Science is imperative for our survival and progress, so I would not say its facinating but more essential. Is science a kind of art? To a certain extend you could say this. It takes skill and improvisation to unlock the hidden secrets of the natural world. Science has a beauty all its own. Science and art always interface to create something new and innovaitive. Take electronic music for instance, this is the perfect example of the science and art interface. The term art has many connotations. What dangers do you see in progress of science and technics? Science and technology are not perilous at all, its the people that control it that are dangerous. Atomic energy does not threaten our very existence its the powers that be and other subversive elements that make it threatening. We are our own worst enemy,not science and technology. People always fingerpoint inventions when their masters should be the ones that are singled out. Machines don't make decisions(at least not now)human beings do.